Pamphilos is a free resume template with a full-width green header. Simple yet stylish two-column layout. This is the kind of design that you can use for almost anything. It is clean, flexible, and can be easily customized. For example, the preview is given with an ID photo (triangular shape). But it will still be awesome with a simple square photo – or even with no photo at all! 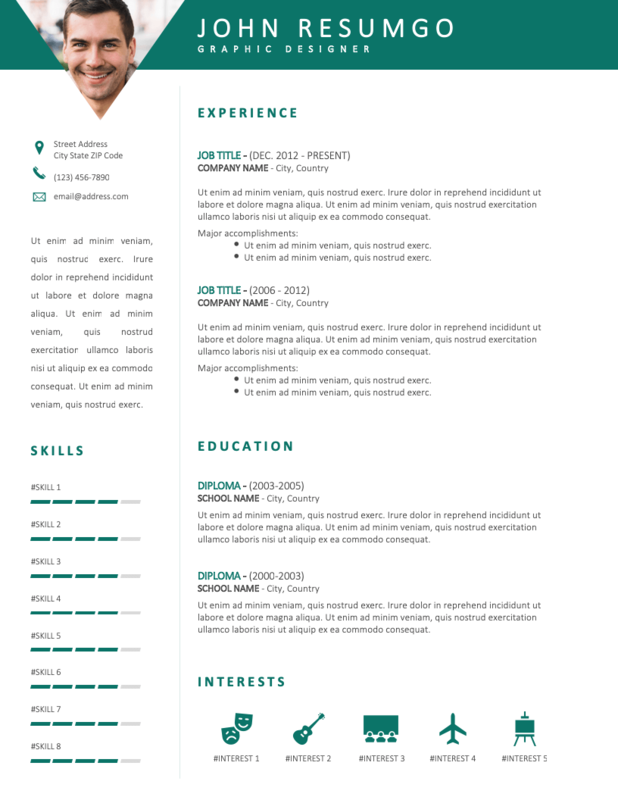 A green color matching with the top banner is used throughout this template: for the sections, the job titles diplomas, and intensity bars (skills), and icons (interests). The left-hand sidebar showcases your contact information, personal statement or summary, and skills. The main body (on the right) features your work experience, education, and interests.